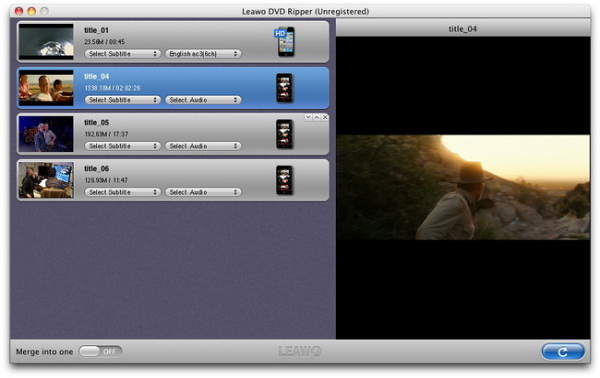 Leawo DVD Ripper for Mac is an excellent ripper to rip DVD to all popular video formats, e.g. AVI, MP4, MOV, M4V, 3GP, MPEG, FLV, etc. 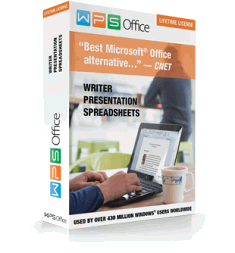 It also supports to convert DVD to MP3 and other audio files like WMA, WAV, etc. With this versatile Mountain Lion DVD Ripper, you can rip DVD on OS X 10.8 and then transfer DVD movie to many portable devices like iPad, iPhone, iPod, Apple TV, PSP, Xbox 360, PS3, Blackberry, Smart Phone, etc. It can also help you rip and convert 2D DVD to 3D movies to watch 3D movies freely. What’s more, this DVD Ripper for Mac features advanced codec settings and extended video edit functions. You can change codec parameters to influence the output spent time, file size and quality. You can also output subtitle and audio track. 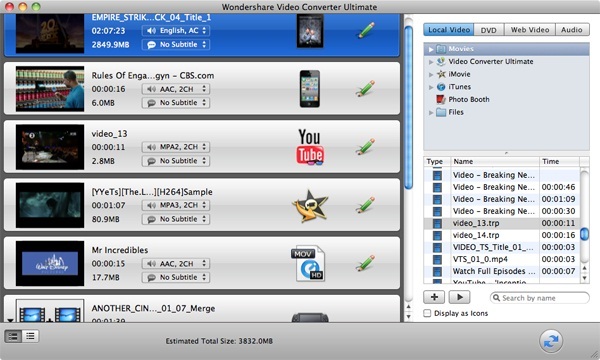 With all these flexibilities, Mac OS users can watch, edit, backup and share DVD movies easily and comfortably! Note:The Mac App Store version of Leawo DVD Ripper for Mac cannot support protected DVDs, please do not make your purchase on Mac App Store. 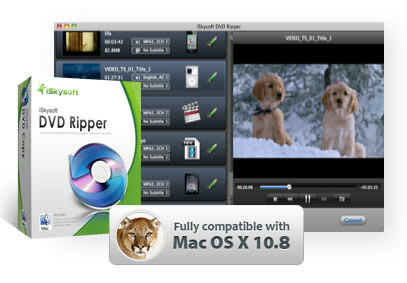 iSkysoft DVD Ripper for Mac is powerful DVD ripping software that makes it easier than ever to rip encrypted commercial DVDs as well as homemade DVD-R, so you can watch, edit and share it all online or off, on virtually any device, including iPhone, iPad, Android–wherever. Rip to iPad, iPhone, Android, PSP and many more device-compatible formats. Backup DVDs to your Mac, Macbook, iCloud–wherever you feel they’re safe. Drag-and-drop or simply click “load DVD” icon on the left panel to input DVD files. You can also navigate to the VIDEO_TS folder. Then on the left processing standby list appears the breakdown of the DVD movie in titles and chapters. You can continue to add a second DVD movie if you have multiple DVD-ROM drive. After loading DVD movies to the program, you can choose DVD subtitle and audio, rename the output files, make a selection of titles and chapters to be ripped, as well as to play the DVD movie in the built-in player. Click the default iPod touch icon in the end of each title, you would see the following profile frame. 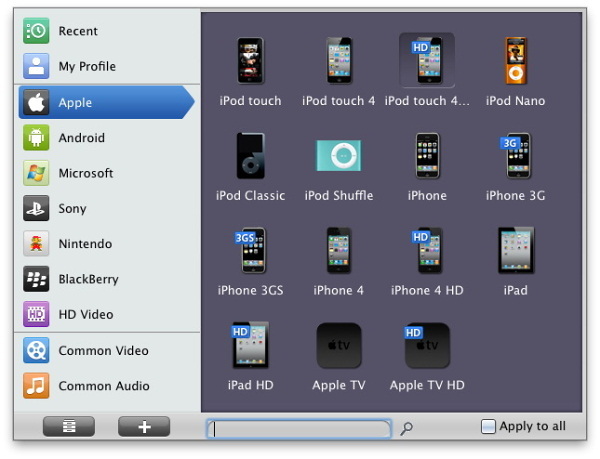 Leawo DVD Ripper for Mac Mountain Lion provides various output profile options for you to choose. You can search your profile in the profile frame or directly input your device name or your desired output profile into the profile search bar for quick profile setting. Leawo DVD Ripper for Mac also preset optimized video for Apple devices like iPad 3, iPad 2, iPod touch, iPhone 4S, iPhone 4, iPhone 3G/3GS. To play DVD on the portable devices, choose the optimized format for the “Format” list. Click on “Convert” button and Leawo DVD Ripper will start ripping in fast speed. Mountain Lion MP4 iMovie Import: Easy Solve iMovie Won’t Import MP4 Files How to play AVI, MKV on 4-Inch iPhone 5?